A 10min read about how to dispute & claim the Airbnb Host Guarantee. Is Airbnb’s host insurance just an empty marketing message? The major marketing sites all have trust and damage limitation messages for guests. There is one company however that plays to the owner and offers a lot of theoretical cover for guest damage, theft and more? This is Airbnb. Is it just great marketing? This extract from their terms (January 2017) explains the fundamental reasons for its implementation. Airbnb provides Hosts with the Airbnb Host Guarantee benefits described herein solely for the purpose of promoting use of the Site, Application and Services by building customer loyalty and strengthening customer confidence as to use of the Site, Application and Services. This seems to answer the question. Does it hold water as an insurance policy? These Airbnb Host Guarantee Terms are not intended to constitute an offer to insure, do not constitute insurance or an insurance contract, and do not take the place of insurance obtained or obtainable by you. Furthermore, these Airbnb Host Guarantee Terms are not an insurance service agreement as defined in a standard ISO renter’s or homeowner’s insurance policy. Other answers can be found in the pages and pages of lawyer speak. We have extracted some of the very important parts that need attention and may help toward understanding the claim process and how to avoid the pitfalls. You acknowledge and agree that any amount of Covered Losses payable to you under the Airbnb Host Guarantee will be reduced by the amounts you have already collected for the same Covered Losses from a source other than the Airbnb Host Guarantee, including without limitation: (i) amounts received under an insurance policy, guarantee or indemnity; (ii) a security deposit; or (iii) payment directly by the Responsible Guest or an Invitee (defined below), or other party or an insurer or guarantor of such party. The cover applies as an excess, only if you accepted any form of compensation from your own insurance or damage deposit. Or if you’ve managed to agree a compensation from your guest. “Host” means a Member who has completed Airbnb’s account registration process, has agreed to the Airbnb Terms of Service, and who lists his/her Covered Accommodation(s) on the Site or Application. You need to have adhered to the “Airbnb Terms of Service” and you must have used reasonable efforts in connection with the stay of the “Responsible Guest at such Covered Accommodation” to comply with Airbnb’s safety guidelines as described at http://www.airbnb.com/safety. One major escape clause for non-payment is the hosts need to follow the local laws, such as licensing. With so many city residential issues the host guarantee is unlikely to apply. In the meantime, please review your local laws before listing your space on Airbnb. More information about your city’s laws and regulations may be available on our Responsible Hosting page in the Your City’s Regulations section. By accepting our Terms of Service and activating a listing, you certify that you will follow your local laws and regulations. 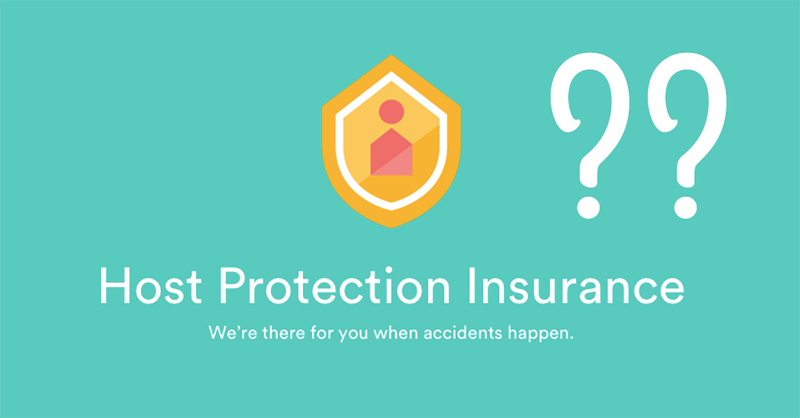 Like all insurance claims, there is a procedure and this is where the problems can occur. We have taken their terms and rooted out the claims procedure and issues. Read these two extracts first and then move onto the steps to make a claim. You acknowledge and agree to use your best efforts to communicate with the Responsible Guest (defined below) as soon as possible after you discover any physical loss or damage to your Covered Property. You must notify the Responsible Guest about your complaint and attempt to resolve the loss or damage with the Responsible Guest within the earlier of (i) fourteen (14) days of the check-out date, or (ii) before your next guest checks in. If you and the Responsible Guest are unable to come to a resolution within seventy-two (72) hours after first contacting the Responsible Guest, you may involve Airbnb to help facilitate the resolution of your dispute through the Resolution Center. If you are unable to reach a resolution with the Responsible Guest after submitting the claim to the Resolution Center, you must notify Airbnb within thirty (30) days after you have incurred the Covered Loss in order to be eligible for the Host Guarantee, unless we provide a written extension of such deadline. For all Covered Property which is damaged or destroyed due to a violation of law or criminal act or misdemeanor and for which you are filing an Airbnb Host Guarantee Payment Request Form, you must file a police report listing such Covered Property and provide Airbnb with a copy of such report, certified by you as true and correct. It doesn’t say when, but we can assume that it’s at the same time as step 3. However, we recommend emailing it to [email protected] as shown on the terms page. Also, phone your account manager and document the time and date of the call. Ensure you keep a timeline of everything you do and be prompt with everything you do. The following extract gives Airbnb lots of latitude to control the claim timelines. The rest of the terms and conditions documentation specifies day limits on everything, this part does not. Is this a legal oversight? You need to initially sort any dispute out with the guest and before anybody else checks into your home! This could be the next day, so time is of the essence… We all know how hard this can be. Immediately contact the guest both directly and via the Airbnb system. Take photos and get any written support from cleaning teams etc that you can. Be careful on correspondence. Stick to the facts and if compensation & quotes are required, don’t just make it up. Also remember Airbnb does not pay for labour costs according to their terms. Within 72 hours of failing to connect and resolve the issue with the guest, you need to contact the Airbnb resolution centre. You then have 30 more days to try and sort it with the guest. If this fails, you must notify Airbnb before the 30-day expiry. Once in the resolution process, you are at the mercy of their internal team, so all previous documentation is invaluable. Their terms also dictate that you tell them of any other insurances you hold that will cover the loss or damage. You must provide Airbnb with proof of ownership of, or legal responsibility for, the Covered Property in the form of receipts, photographs, videos, documents or other customary forms of proof (including, but not limited to, appraisal or valuation forms or notices addressed to you) certified by you as true and correct and reasonably acceptable to Airbnb. Assuming you have made progress and some form of resolution is forthcoming then you will be notified by Airbnb. 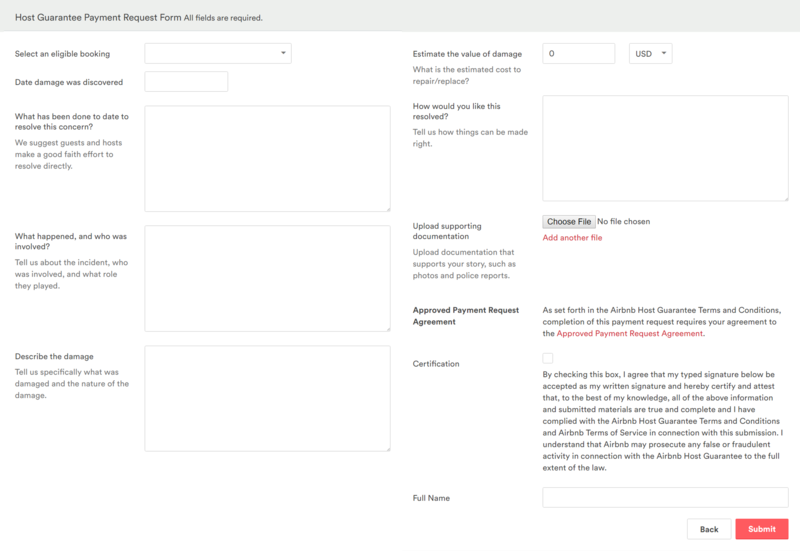 You’ll be required to deliver to Airbnb an executed “Approved Payment Request Agreement”, supplied by them or a third party. In any event, we will use commercially reasonable efforts to complete processing of your Airbnb Host Guarantee Payment Request Form within three (3) months after our receipt of such documents and information. A great deal or just great publicity? On the face of it, the host guarantee appears a great deal, but who actually reads terms and conditions. The real issues relate to the key cover terms and the process in terms of timing. The first port of call is a claim from the guest, not Airbnb. The timing issues and Airbnb’s own timing controls mean there are potentially impossible delays to rectify the issues. The owner is likely to head off to their own insurer, in which case Airbnb’s liability almost certainly disappears. There are potentially impossible delays to rectify the issues and an owner is likely to head off to their own insurer, in which case Airbnb’s liability almost certainly disappears. We did a brief search to see what other people’s experiences are which seem to validate what we have surmised.